I have been baking with wild yeast sourdough for the past 5 years. It all began when I purchased a starter from Sourdoughs International. One starter led to another starter, until I had 5 different ones. Recently, I felt up to the challenge of making my own wild yeast starter from scratch. I had tried this once before, many years ago, with no success at all. At that time I knew next to nothing about wild yeast and how it works. This starter recipe is awesome because it really works, and it explains why it works. The starter I made is very good. The flavor is amazing and it rises very well. I purchased rye and wheat berries at my local health food store and ground them in a coffee grinder to make flour for my starter. It was kind of tedious to grind but I only needed a few tablespoons. I'm sure that you could just buy freshly milled flour at the health food store and it would work just as well. The wild yeast is on the grains and you just need to provide the right conditons to wake it up. Cover and let sit at room temperature for 24 hours. Stir well, cover and let sit at room temperature 24 hours. At day 2 you may (or may not) start to see some small bubbles. Stir well, cover and let sit at room temperature 24 hours. Stir down, measure out 1/4 cup and discard the rest. *You can feed the starter whatever type of flour you want at this point (unbleached white, whole wheat, rye). If you are new to sourdough, a white starter is probably the best choice. All-purpose flour is fine--a high protein flour is not necessary. Once daily until the mixture starts to expand and smell yeasty. It is not unusual for the mixture to get very bubbly around Day 3 or 4 and then go completely flat and appear dead. If the mixture does not start to grow again by Day 6, add 1/4 tsp. apple cider vinegar with the daily feeding. This will lower the pH level a bit more and it should wake up the yeast. The yeast we are trying to cultivate will only become active when the environment is right. When you mix flour and water together, you end up with a mixture that is close to neutral in pH, and our yeasties need it a bit more on the acid side. This is why we are using the acidic fruit juice. There are other microbes in the flour that prefer a more neutral pH, and so they are the first to wake up and grow. Some will produce acids as by-products. That helps to lower the pH to the point that they can no longer grow, until the environment is just right for wild yeast to activate. The length of time it takes for this to happen varies. When using just flour and water, many will grow a gas-producing bacteria that slows down the process. It can raise the starter to three times its volume in a relatively short time. Don't worry--it is harmless. It is a bacteria sometimes used in other food fermentations like cheeses, and it is in the environment, including wheat fields and flours. It does not grow at a low pH, and the fruit juices keep the pH low enough to by-pass it. Things will still progress, but this is the point at which people get frustrated and quit, because the gassy bacteria stop growing. It will appear that the "yeast" died on you, when in fact, you haven't begun to grow yeast yet. When the pH drops below 3.5--4 or so, the yeast will activate, begin to grow, and the starter will expand again. You just need to keep it fed and cared for until then. Once your wild yeast is growing, the character and flavor will improve if you continue to give it daily feedings and keep it at room temperature for a couple of weeks longer. After that time, it should be kept in the refrigerator between uses/feedings. I recently made this starter from directions given to me by another baker and was amazed to get a very active whole wheat starter using pineapple juice poured and strained off a can of pineapple chunks. It took several days for the starter to get going and I was getting impatient with it. But it did jump to life on about the fourth day and I was thrilled! I never would have thought to mix whole wheat flour and pineapple juice together to make a starter. Wondering if the idea is to get some fruit acid if meyer lemon juice would work? I always have so much lemon juice hanging around and never have any orange or pinapple. Although, oranges are easy to come by, just drive down the road this time of year and i can pick some up.. Thank you, Teresa, for your nice comments. I am passionate about sourdough and I really love to help people learn how to make and use their starters. The pineapple juice makes the starter just about foolproof as it eliminates the possibility of mold growing and ruining it before the yeast gets going. The other factor I can't stress enough is, make sure your whole grain flour is REALLY fresh for the best results. Thank you for your enthusiasim. It makes me try harder. I'm pretty knew at this, done a few loaves... Need the encouragment I guess. Thanks again. I've always wondered how the early settlers managed to make such nice loaves of bread in the olden days. It seems that more or less modern yeast didn't come out until after 1850 or so with Fleishmann's innovation. I guess that is probably why you all like this topic. Bread is great. Keep baking. Sourdolady, very interesting starter method and excellent explanation! I also believe that the yeasts etc we want are on the grain rather than just floating about in the ether. There are lots of things in the air - mould for a start - but I want those kept OUT of my starter, not included in it! I've seen a starter recipe very similar to yours, but using live yogurt with water to lower the pH level. It also introduces some lactobacillus which assists the sour flavour later in the bread process. Mine was just water and rye - and as you say, it looked very perky by day two, then went dormant for almost a week before the yeasts got going well and it really developed. Excellent starter though, made last May, and it seems to just get better and better. Well Sourdolady, after four or five abortive attempts over the years I've finally got a lovely sweet-smelling yeasty starter - your starter recipe worked first time (oh, by the way, I incorporated Floyd's tip about using raisin-water) so many thanks. Bread in the next few days I hope . . .
Congratulations, Bernie, on your new starter! I'm glad it is working well for you. When you start baking just remember to be patient. Sourdough takes longer to rise than commercial yeast. Don't rush it. Have fun and good luck! Just to reiterate that there isn't really a pressing need for juice - just flour (rye for choice) and water will make an excellent starter, using sourdo ladies method as above. Rye isn't required after about the 3rd feed, unless you want to make a specifically rye starter. The bacteria which make the bubbles by about day 2 or 3 will lower the pH perfectly well and then the it will go dead looking. If you continue to feed though, it will come back by day 6 or 7 and then it is the yeasts you need for bread. I'm quite sure the sourdours produced over the past 6000 years or so in Europe and the middle east didn't use pineapple juice or anything other than water! The bacteria and yeasts needed are present in the flour - especially rye to start it off. > anything other than water! Interestingly enough that might not be the case. King Arthur Flour is doing some research on bacteria which indicates that a non-sour bacteria might be growing more common [no pun intended] on flours, even organic flours. This bacteria crowds out the sour-forming bacteria and prevents a true sour culture from developing. This work is preliminary and I have only seen references in forum posts, but their testers are recommending that if you can't grow a sour culture with plain water you should try using an acidic juice for the starter and first feeding to create a better environment for the sour-forming bacteria. Of course, we have no way of knowing how sour, or otherwise, cultures from tens, hundreds or even thousands of years ago were.... perhaps a better terminology would be naturally leavened bread? It is quite possible that lots of naturally leavened breads, using a starter which could have been kept going for generations, produced breads which were well flavoured, well rising, but not at all sour. And of course, the starters could have been originally made using plain water, or pomegranate juice, apple juice, grape etc, or even yoghurt - many variables which would have produced a vigorous and viable starter. Perhaps it is our present fondness for a sour taste which is out of kilter??! I agree with Dulke - a thicker starter keeps better in the fridge. It can go WEEKS without feeding, then when you refresh, it's ready for baking after 2cnd feed. I use quite a lot more flour than water- typically 30 grams starter, 30 grams water and 50 grams flour, which makes quite a thick paste, but it slackens off after a couple of hours as it begins to ferment, at which stage I put it back into the fridge. Just look at it as a practice round for the long, slow ferments you'll be doing with your sourdough breads. Great looking loaves of bread, you guys! Keep up the good baking. Ray, you can feed the starter as much as you want in order to increase the quantity for your recipe. You can also adjust the amount of flour to water to get the consistency of starter that you prefer. Keep in mind that when you use a recipe the original baker's starter may have been either wetter or thicker than yours so adjustments are often necessary. It is always better to err on the side of wetter dough as too much flour makes for tough bread. Remember also to look after the starter! The flavour / activity just get better and better as the months go by - so treat it as an heirloom in the making! Sorry I missed your post in December. How's the starter going? Leaving it out at room temperature for 2 weeks is just to get it established and growing well. During that time you must feed it at least once daily, but every 8 hours is better. Before feeding, dump out all but a very small amount. I would recommend saving only a tablespoon and then feeding it with 2 oz. each of flour and water. At this stage you don't need large volumes of starter. Once it is performing well and you have baked successful loaves of bread with it you can start storing it in the fridge between bakings and feeding once a week or so. You can go much longer between feedings, and especially if you keep your starter thick, but your starter will perform better if you keep it fed frequently. I've only made and have since maintained one starter in my life, so I can't speak from to much experience but it sounds like it's going fine. It's only been a week. Just keep throwing half out and feeding it with flour and water. I personally don't believe there is any reason to use anything but white flour or vinegar/oj. My feeling is that if it can be done without vinegar or oj, than there is no reason to put them in there at all. But there is a million ways of making/maintaining a starter out there and nearly all of them will work. If your leaving out on at room temperature I think it's best to feed it daily even if it appears to not be doing anything. But if it smells winey like you said, it should be well on it's way. A few more days and it should be ready to store in the frig, if that's what you plan to do with it. I guess temperature could have a big effect at this early stage of starter development. I started mine in this past summer and I started using it after a week but the first two breads I made with it I had to admittedly knead in some instant yeast because it was taking longer than I planned out. But now it's several months later and I couldn't be happier with it. I think wild yeast does better in colder temperatures than instant yeast so it's kind of perfect for baking in the winter. I think since essentially my sourdough starter "lives" in the frig that the yeast that has developed and is especially suited for cooler temperatures, I could be wrong, but your starter will become a good friend and your jar of regular yeast will get pushed to the back of the frig near some old store bought fruitcake someone gave you for christmas. I'm right there with you. It kills me to throw out starter but don't worry once the culture is healthy which it sounds like it is you can really choose your own way to do things without ever having to throw any out. You just have to do the whole throwing out thing at the beginning because you want to feed it with enough fresh flour and water to help the yeast grow and this just eventually leads to having to much. I've find I'm keeping less and less starter around and ever once in a while making pancakes or dog treats or something recipe that uses a lot of it. If you have any questions just let me know. Rick, once the starter is bubbling well and obviously active you can increase the amount you feed it to obtain however much you need for your recipe. In the early stages you would just be wasting flour if you fed that much. Many people like to feed their starters by weight, for instance = 4 oz. flour and 4 oz. water. That would make a starter with 100% hydration. You can feed it as much as you want to in order to make the quantity that you need. Your starter doesn't care if it is thick or thin--it just likes to be fed regularly. Do it how you prefer, but always dump out most of the old starter before feeding. You still have a few more days to go before you will have an active starter so be patient! Yay you just answered my question on what 100% hydration is (I kind of thought that was what it was). Hi Well I just started mine. Well I just started mine. But have a question or two. "Once your wild yeast is growing, the character and flavor will improve if you continue to give it daily feedings and keep it at room temperature for a couple of weeks longer. After that time, it should be kept in the refrigerator between uses/feedings." Qt. What are the daily feedings? The same as day 4, Stir down, measure out 1/4 cup and discard the rest. 2 T. juice , as in days 2 & 3? Is it this again and again? I enjoy cooking with wine. On occasion I even include it in the recipe. I'm confused...Juice or no juice? So are you saying that you shouldn't use a citric juice? I do only water and flour. At first I tried equal amounts, but because of the altitude, I had a bit more water. Just as I have to increase my liquid when I make the dough. I tried adding commercial yeast, but (as S. John said would happen) some "sourdough snobs" pooh-pooh'ed that saying 'NEVER add commercial yeast to your starter.' And that's okay, since I didn't get great results from that either. When I finally got my patience, or lack thereof, under control, it finally performed as desired. After using it, I inadvertantly (I wasn't paying attention at the store) used bleached AP flour. It would double, then die. Some said use it anyway. I did when I made my stromboli. Worked well. I still don't know why the bleached AP died, but oh well. Anyway, I've seen recipes using honey, sugar, commercial yeast, and orange or grapefruit juice. If the acidic juice brings down the pH, isn't that a bad thing? Steph, the juice is only used in the first few days when you are creating a brand new wild yeast starter. Once the yeast wakes up and starts to grow you should switch to water and continue to use water thereafter. As for the bleached flour, I really can't say much. I only buy unbleached. I have read that the bleaching process can leave residues that are harmful to the yeast, but I am sure that once your starter is well established it wouldn't kill it. Sourdough yeasts thrive at a low pH (3.5 to 4), so NO, the juice isn't a bad thing. After your starter is established it will naturally maintain a low pH all by itself with no juice needed. Can I leave my starter when it is still a baby? My starter is performing very nicely as of Day 7. On day 11, I have to go out of town for 5 days. If I give it a good feeding before I leave, will it survive in the fridge until I get back? Should I do anything special to revive it when I return? Thanks. 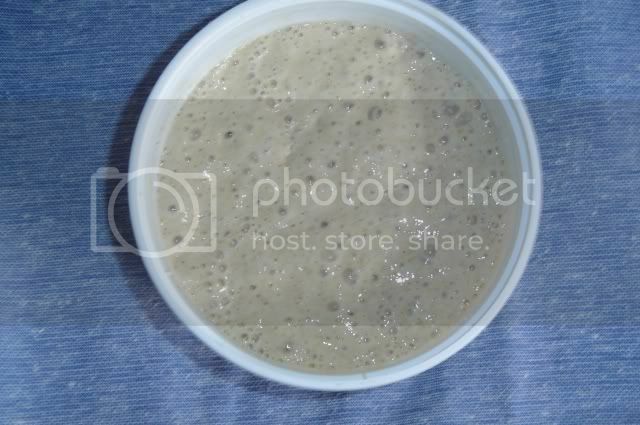 By day 11 your starter should be well established if you keep it at room temp and feed it two or three times a day. It will keep just fine in the fridge. When you feed it for the last time before leaving, add more flour so it is quite thick. Let it sit out for an hour or two before refrigerating. When you come back, just take it out and let it warm up and then discard most of it and feed again. It should bounce right back. I've been following the directions given here for making the wild yeast starter...and trying to be patient. Last night was Day 11, and the starter had lots of bubbles in it, and had risen (at one point) a little bit (maybe 1/8 inch) above the mark I put on the side of the container. This is the first time I noticed any rising. It also tasted nice and sour. Anyway, I fed it as mentioned in the directions (as per Day 4), which I have been doing all along. I've noticed that it gets more bubbly when it's thicker in consistency, ie. I mix in a little less water than flour when feeding. It's been sitting on my kitchen counter, where the temperature stays pretty much at 70° to 73°, maybe a little higher, like 75°/76°, if I use the oven. I've not yet put the starter in the refrigerator. At this point, should I be feeding it more than once per day? Is it at a point where I can use it for baking? How do I get it ready for use in baking? Yes, clean utensils and containers. Plastic container. Plastic and/or wooden spoon and spatula. Stable temperature, 70° to 73°, with an occassional short-term rise to around 75° when I use the oven. Starter was started with whole wheat flour and pineapple juice. Water used is bottled and basically distilled water. I've had these same results when in CA. I'm now in NY. I'm at a total loss and very frustrated that my starter isn't doing anything it's supposed to be doing. I'd hoped to be baking bread soon, but...I don't see that happening. What am I doing wrong? Re: So what does one do? Personally, in that situation I would throw it away and start over. It took me three tries to get a good rye starter working; it was frustrating to throw the first two away (esp the 2nd one that was going OK and then molded) but that is what it took. You might consider trying a different brand of (organic) flour. I'm not sure exactly what feeding schedule you have, but here's my way of working with a starter that won't take off but has some sluggish activity after 4-5 days. Feed it 1:4:4 by weight of starter:flour:water. Let it ferment for about 12 hours at room temperature. Then, refrigerate it for 12 hours. Repeat this cycle until it starts to "take off". The same cycle can be used for a few more days after it becomes active. After a few days, you can refrigerate it after feeding it and letting it ferment for a few hours and it should keep for weeks. If you have the time, I would suggest splitting the culture in two. Add acid (vinegar) to one, and not to the other. I've found that the acid can help, but often it delays the process yet a few days more, depending on the cause of the sluggishness. If you notice the culture is less active after the acid is added to the feeding, then stop the acid addition and just continue the feeding/refrigeration cycle. I have wanted to get some of their starters from around the world, but wanted to know if their claim that the starters will persist as when purchased is true, or do they morph into what ever you would end up with if I started my own in my own little corner of the world? Another way of saying it is, will the San Francisco starter remain the SF starter for years/ever, or will it not? I tossed the first try, bought all new flour and started over. I also put it in a smaller container to make it easier to see any rising. And I'm happy to report that on Day 6 the starter had bubbles and froth, and smells faintly like beer. LOL So it's working. I also got my San Francisco sourdough starter (purchased from Sourdoughs International) going, so for the past few days I've been able to compare the two, side by side. The wild yeast isn't as...active as the San Francisco, but then the SF starter has been in a proofing box, where the wild hasn't. Am I correct in guessing that this may be part (most?) of the difference between the activity levels? At any rate, I'm looking forward to my first loaf of sourdough bread, which I began last night using the SF starter. It'll help me be patient while the wild starter gets going enough to begin using. Thanks for all your help. And SourdoLady, I think I may know you from another cooking forum I used to participate in a couple years ago. My name is the same in both. Yes, I remember you from the other forum. I think I once sent you some dried starter, didn't I? Sounds like your wild yeast starter is going well. Just keep on feeding it for a few more days and it should be strong enough to make some bread. The proofing box does make a big difference. The warmth makes the yeast grow faster. How did the SF bread turn out? Yes, you did send some dried starter. Unfortunately, due to circumstance both in, and beyond, my control, I had problems with it. No fault of yours, or the starter, at all. My bad. Putting the wild yeast starter in a smaller container has helped me to see what it's doing. In the other container, all the risings and such were going out (ie sideways) instead of up. Smaller container and they're going up now. Much easier to see. The San Francisco bread was, in a word...wonderful. The flavor was exactly as I remember from so many years in the Bay area. I used the no-knead recipe, which fits very well around my crazy work schedule. It didn't rise as much as I'd have liked, but I think that has more to do with my inexperience working with sourdough than anything else. And the crust is a bit too hard. But when I first tried the no-knead recipe using commercial yeast, I had the same 'hard crust' problem. It took some fiddling with the cooking time to fix that. I'm guessing the same will apply with the sourdough. I'm looking forward to making more. Thanks for all your help. Can you tell me how much this makes and how to grow it large enough to make two-cups of output every week or so? Do you continue to feed your starter equal parts water and flour? I'm saving a copy of your deluxe sourdough bread recipe, and want to have my starter about the same consistency the recipe expects. Also, for the lemon juice - is bottled OK? I keep fresh lemons around when I can, but not always. I'm afraid I'm bad and I just dump flour and water in when feeding my starter. I know from looking what the consistency should be for my preference. I would describe it as thick pancake batter. The freshly mixed dough is quite soft and sticky immediately after mixing but it strengthens up nicely if you do a couple of folds spaced 45 minutes to an hour apart. Thanks SourdoLady. Thick pancake batter I can manage! I'll make a note on your recipe. The juice definitely does help, even though many people from the "old school methods" refuse to admit it or even try it. Peter Reinhart even uses this method in his new book, "Whole Grain Breads". I am on day 4 of using sourdoughladys starter receipe of fresh wwflour and pineapple juice to get a sourdough starter. I have a white fuzzy mold growing up the side of container. I will starte over today. If anyone can tell me what I did wrong or how to prevent this I would be greatfull. I am new to baking and have never done sourdough befroe. Well, I should have read more post before I wrote the above. I read sourdoughladys answer to someone elses mold problem. I had not thrown out mine yet so I was able to get 1/4 cup that was not touching the mold and put it in a diffrent clean glass container, I then added the 1/4 cup AP flour and 1/4 cup water. I used my well water. I also used a clean damp paper towel to clean the sides of the dish so no dough smears were there. I have it covered with the glass lid of the bowl. Is that ok or should I use a clean towel? I wanted to thank you directly for the great starter recipe and for your help. The starter is taking over my kitchen and I'm thrilled. I made my first loaf of bread last night- also using your advice- I converted a recipe I use to make sandwich bread. It was delicious and is GONE! I have some rolls rising now and plan to make your Deluxe Sourdough tonight. That's a normal smell of fermented sourdough. It just needs to be fed (dump out most of it before feeding). If it is growing well you should probably start feeding it twice a day instead of only once. Do this for a few days before you start storing it in the fridge. a little yeasty help please! My Second starter is your recipe for the wild yeast. I'm on Day 3, and I haven't seen any bubbles... am I a yeast killer? I long to have 4 year old yeast growing in my fridge (four years from now) but I just can't seem to get it going. Day 3 is too soon to expect much. Give it a few more days. It usually takes about a week to get it going. Patience is the key with sourdough. Oh, and by the way--don't add commercial yeast to a wild yeast starter! It won't do you any good and it will probably just cause you more trouble. Wild yeast WILL grow, you just need to be very patient. Ok, I can be patient. At what point, after adding 1/4 cup flour and 1/4 water (if it takes a week of doing so, every day) should I save 1/4 cup and throw the rest away? And how much starter equal 1 package of yeast? How much do I use in a typical french bread recipe. And this wild sourdough yeast starter can technically be used in any recipe, right? Thanks sooo much for all your time and help!! From Day 4 onward you should be discarding all but 1/4 cup and then feeding that 1/4 cup. When your starter matures enough so that you want to start baking with it, then you can increase the feeding amount so that you have a larger quantity of starter to make your recipe. I would recommend that you start out by using a recipe that is written specifically for sourdough rather than trying to convert a non-sourdough recipe. It is just a lot simpler for you and there are several posted on this site that you could use. How is that starter coming along? Sorry I missed your post earlier. No, you don't have to wash your container every time you feed it. Just wash it when it starts to get build-up around the top. It is important to keep it clean and free of unwanted contaminants and always keep it covered. Thanks for following up! I have a healthy starter, and it is now in the fridge (which reminds me, I need to feed my little bread baby). I have made one batch of sourdough. It was NOT great, but it was a start -- seriously I chose the wroooooong recipe -- it WASN'T yours or even from this site...read my blog entry regarding my recipe choice and you'll understand: http://bikebookandbread.blogspot.com/2008/08/first-sourdough.html. Texture was horrible but the flavor and level of sourness was quite good...at least I know I have a healthy starter! I will be beefing up the starter tomorrow morning for a loaf on Monday or so. Glad to hear you are having some success, Brigette! Sourdough is just so much fun, and oh, the flavor. I try to check this thread from time to time but sometimes I forget for awhile. The other day I tried to post several times and the site kept freezing up on me. Hopefully with the new upgrade things will be better. I have never lived in a climate such as yours, but I'm sure it would work just fine. You will find that your dough will rise faster because of the warmer temps. You may have to use a bit more flour in your doughs because of the humidity. Breads that rise fast have less flavor but you could counteract that by refrigerating the dough and baking it later. There is no reason to worry about the smell. Sourdough does not have a bad smell. Give it a try! It is not unusual that you mixture was dry. Rye flour can absorb a lot of liquid. Adding more juice is fine. It will work either way, but wetter will start the yeast growing faster. Be sure to keep it in a warmish place, too, for a quick start. Good luck! Let me know how it goes. I started my starter with water and rye. With 24 hours it was really bubbly and rose quite a bit (almost doubled). I've read that the initial rise is often caused by "bad" bacteria. It doesn't smell to good (not sour). Do you think I should keep feeding it as outlined above and wait for the wild yeast to take over? At what point do you think it'll be ready? Other than activity, what signs should I be looking for? Yes, keep up with your feedings. This first bubbling is not yeast. When it is actually yeast growing, it will smell yeasty at first and then winey or alcoholic as it ferments further. Since you didn't use the fruit juice, I highly reccomend that you add 1/4 tsp. vinegar now (only the one time). It will lower the pH and make your starter activate quicker. It will also deter the growth of bad bacteria that can foul your starter. Don't be surprised if your starter appears to be dead for a couple of days now. When it starts to bubble again, it is the real yeast starting to grow. It will start as a few very small bubbles on the surface, which will continue to grow in both number and size. From the time you first see them begin to appear it may take a couple of days before you see a lot of activity. You will know when it happens. Keeping the starter warm (80 to 85°) will accelerate activity. Have fun, and good luck! I doubt that you ruined it. Keep up with the daily feedings, but only do the vinegar the one time--don't keep adding more every day. You should be close to getting the starter active. Hi, I just found your recipe and this great discussion on sourdough. I started a sourdough 3 days ago or so with flour and water. I have a question about your method. Do you keep feeding it juice and flour forever or just for the first couple days? My big question is how often can you feed sourdough? My kids and I are doing our sourdough together. They wanted a pet and so we are starting out small, with a micro-organizim. We named it "Yeasty the Beasty". The kids are enjoying feeding our little "pet" and I look forward to baking bread. We fed it in the morning and then we fed it at night. The kids have been asking me why doesn't "Yeasty" eat lunch? How often can you feed your sourdough? Can you feed it 3 times a day, or would that be bad? First of all, I will say that I am not a fan of freezing starters. Many will not survive freezing. It is not really necessary to freeze a starter because they will keep for months just in the fridge, even without feeding, if they are healthy going in and are kept at a thicker consistency (more like soft dough). Since you have already frozen your starter, take it out and discard all but a couple of spoonfuls. Feed it with flour/water to the consistency that you like and set it in a warm place. If it is still viable, it will get bubbly. It could take 24 hours or more to wake it up, or it may bubble within a few hours. What was the source of your starter? Did you make it, or was it given to you? The reason for discarding old starter is that is has used up all the nutrients in the flour and no longer has any food value to the yeast cells. The yeast cells have multiplied by great numbers so you now have WAY more hungry yeasties to feed. Discarding gets rid of most of the waste and also thins out the number of hungry yeasties so you don't have too many of them competing for food. If you never threw any out, you would be feeding buckets of flour to keep them happy. Yes, you can use these discards in any other baking that you want--add to pancake batter, quick breads, etc. You don't need to save much starter for storage in the fridge. I generally only save 1/4 cup. When you want to bake with it you can build the quantity with a couple of feedings. When maintained this way, you will not be throwing out a lot of starter. The amount of starter used in a recipe will determine the length of time it takes from mix to bake. It will also have an impact on flavor. 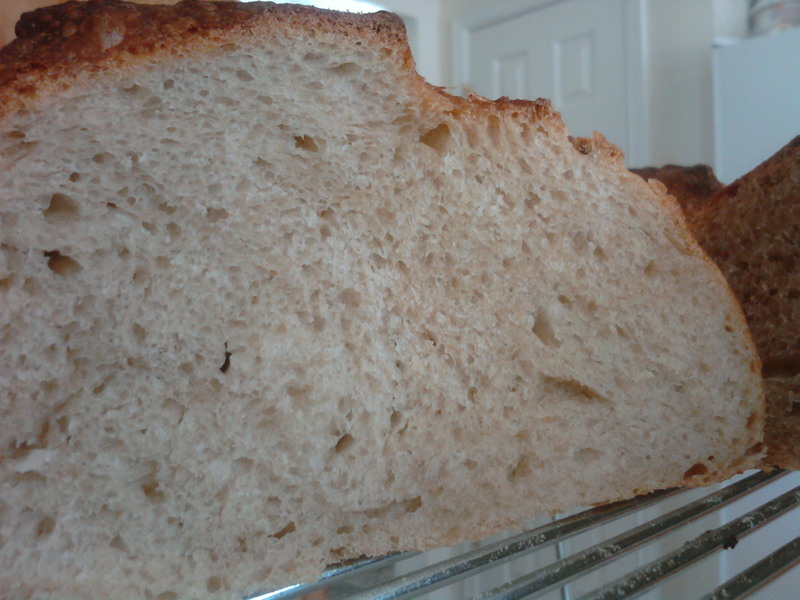 Less starter=longer fermentation=more flavor and tang in finished bread. Whole wheat or rye included in the dough will also add more flavor and tang. Sour flavor can be very elusive sometimes. I get my best sour when I make a dough and then fold the dough every hour until the yeast starts to make the dough spongy, shape-rise-bake. You can also refrigerate the dough just before it is ready to shape OR shape and then refrigerate. Take out and continue the next day. This can add a lot of additional flavor to the bread. You just need to play around and experiment until you find the right technique to give the results you are after. For the chewy, moist bread you need a softer, wetter dough. The shine on the crust of my loaves is simply butter brushed on the hot bread just out of the oven. This also softens the crust, so if you like crispy crusts, don't do it! I'm currently on day 2. last night, I mixed 2 tbs. whole wheat flour and 2 tbs. of lemon juice mixed with some warm water. is this okay? I didn't have oranges or pineapple juice, and I figured lemon isn't too acidic if we can use vinegar (which has a very close pH level). still, I was reluctant, so i dulled it out with some water. I hope it works. also, should I leave my container a little open, or should it be closed tightly? How did the lemon juice work out? I have never used it in a starter. It sounds like a lot of acidity, but I'm just going by how sour lemon juice tastes. I have no idea what the pH level is. Your container should be covered, but not so tight that gasses can't escape. I'm almost at the end of day 4, and yesterday I started getting that alcohol smell and bubbles. It only worked after i dilluded the lemon juice WAY down. lemon juice has an acidity of 2 (pH). day one I put 1 tbs of water and 1 tbs of lemon juice, and on day 2, I put 1.5 tbs of water and .5 tbs of lemon juice (that seemed to work better). I am attempting to make starter from fresh pineapple after watching the Nancy Silverton PBS video where she talks about doing the same with fresh grapes. She gave no further instructions after submerging the grapes in the slurry. My questions: 1)Is there a different treatment for this type of starter? 2) When do I start feeding? 3) Should I have been stirring the slurry once in a while? I have just completed 3 full days with no feedings nor stirrings. Since day 2, there have been tiny bubbles on the glass walls. The odor smells like that of fermenting pineapples and is not unpleasant. Now all you have to do is add some flour and let it rise. Then add to a recipe when it starts to smell yeasty again. It will do it. This reminds me I started Kiwi starter more than a week ago and forgot all about it... ...it doesn't look good. Looks really bad in fact. Once it gets bubbles and starts smelling fermenty, better to park it in the fridge or keep cool. I'm just now finishing day 9, and I'm a little worried. I'm getting a LOT of bubbles, but no rising. the alcohol-like smell ceased to exist several days ago. I changed my starter from whole wheat and lemon juice to unbleached AP and water (except for 2 days in which i used bread flour, because i ran out of AP). does this mean I'm doing something wrong? I'm not sure about the lemon juice. It may have lowered the pH too much. Don't add any more of it. Do you have any rye flour? If you do, add a T. of rye with each feeding and see if that doesn't get it lively. If you don't have rye, and can't get any, then use a T. of WW instead. Bread flour is fine, and won't hurt anything. Are you using unchlorinated water? Are you keeping it in a place that the temps are in the mid-70's? If it is cooler than that, it will take much longer to start. I'd give it a few more days before you get worried. i dulled out the lemon juice, and it worked after that... no rye, so i'll add WW. temp should be right, I'm just leaving it out on the counter (I live in western washington state). but how do I find out about the water? I'm using tap water.... (the tap water in washington is pretty good, though). Glad it is working better. To find out about your water, either call or go to your city water plant's website. Ask them if they use chlorine or chloramine to treat the water. Chlorine will dissipate if you let it stand several hours. Chloramine is stable and will not dissipate--it is harmful to growing sourdough. Another alternative is to use bottled spring water. Don't use distilled water because distilling removes the minerals and you want the minerals there. I tried looking for the info about the water, but i give up. I have no clue where to find it. I'm thinking about adding some honey. I read that in Rinehart's bread and crumb. O Mi Goodness, I shocked myself! Both starter and bread were very successful! I was a little shaky in places not knowing how things are supposed to go but tried not to panic and just follow the steps. Amaaaazing! I followed her bread recipe almost exactly except for the potato flakes (used potato water for my water) and replaced some of the total flour with organic rye flour (1/2 cup and 1/2 cup white whole wheat flour) then King Arthur whole wheat bread flour for the remaining flour. Kneaded in approx 1 tsp. caraway seed towards the end of the kneading period. I used a 38 degree garage as my "refrigerator" overnight. Worked great! my room temp is only 60...I am one cool cat, ha! So I put it in the oven on warm very lightly to rise the next day to kind of raise that temp a bit but not too much bec as she says you want it to rise slowly not as fast as regular bread. I shaped it into one big round loaf rather than two smaller ones. It turned out soooooo good, I am just thrilled and stuffed to the gills with that oh so wonderful tasting bread that I never thought I would be able to make! This has the crusty chewiness that I love. Cheers to Sourdo lady. Hope all will use her techniques. I'm on day 4 of my starter and it smells a bit cheesy. Not particularly good cheese, but not awful cheese either. I did not use pineapple juice, because I didn't have any. I used just flour and water. I'm going to do the refreshment this evening, but wanted to see if this is a lost cause. I did get some pineapple juice this evening and will start another batch. It is nothing to worry about. In the early stages starters can have unusual smells. They will go away after the starter activates well. You really don't need to start over with your starter. I would just give it a feeding with the juice now, and maybe again tomorrow--then continue on with the flour and water from then on. Hi Sourdolady, I have followed your instructions to make my own wild yeast. I live in NW Canada and needless to say it's very cold and dry here. Today is day 10 and I am getting more bubbles but the volume has not yet doubled. I am hoping if I keep feeding it, I will be able to use the starter next week. How do I post a picture here? Oh, I figured that out. Day 10 of my wild yeast starter using rye flour and pineapple juice. That's looking pretty good! Are you planning to keep it a wholegrain starter, or are you going to switch it over to unbleached white flour? Wholegrain won't rise as high. Now that it is actively growing, I would start giving it two feedings a day. Don't forget to always discard at least half of it before feeding. You will also get more rise if you make your starter thicker in consistency--more flour than water. Just because it doesn't double doesn't mean it isn't capable of rising a loaf of bread. I'd give it a couple more days of twice daily feedings and then try baking a loaf. Thanks, Sourdolady! I have started feeding the starter twice a day and today I put some unbleached flour in it. Instead of throwing away 1/2 of the starter, I saved it for an experiment. I fed half of the starter with the same amount of flour and water. For the other half, I used less water (as you had suggested). A few hours later, the drier starter did rise more than the wet one. The wet one got more bubbles but didn't rise as high. Truly interesting. I use the wet starter to make a sponge and I am going to use it to make pancakes and maybe even a loaf of bread tomorrow. Will see if the new starter have enough strengh to rise a loaf. I am getting pretty excited. Thanks again. I will keep you posted. I did it! The wild yeast looked pretty good last night so I made a sponge. Then this morning I made this huge loaf of Russian Black sandwich loaf. I allowed it to rise 4 hours the first time then 2 hours the second, totally 6 hours. It rose a lot bigger than I thought but the texture was soft like white bread, with the nice rye flavor. We had some for dinner and loved it! Thanks Sourdolady! You did a really good job on your bread! You should have taken a crumb shot, also. I'll bet it was really nice on the inside, too. You will notice that the flavor will change as it ages over the next couple of days. The volume of the bread and your description of the crumb are 2 characteristics that I'd like to have in my bread. Is the recipe here somewhere? I may have missed it. I'm inspired to try it. The recipe says 12 serving, an 1-1/2 pound loaf. Believe me, it's a lot bigger than 1-1/2 pound loaf. Next time I will either reduce the ingredients to make a smaller loaf or make two medium loaves. The loaf I have is so big that it couldn't fit into a regular whole grain bread bag. I'll try not to change a thing. I love it the way it looks, and from the ingredients, it must taste good and a bit on the sweet side, which is just the way I want it. are you using only 2 tsp starter in lieu of the active dry yeast ? Hi Loraleigh, I am glad to hear that you are not giving up. Cultivating you own yeast could be a challenge yet a lot of fun once you got it right. I could be wrong, but I think if you kept all the starter and fed it once or twice a day, and each time the volume doubled, you would soon have a huge batch to feed. That's a lot of flour and you would need a very large container to do so. By keeping only 1/4 cup, you only need to come up with 1/4 cup of flour for the next feed. There may be another reason behind this but at least this is why I discarded mine in the beginning. Once my starter begins to look active, I saved the rest and used it to make pancakes for the next morning. We have been having a lot of pancakes for breakfast and my fmaily is loving it. First, thanks so much for this wonderful article. I failed a year ago to make my own starter, using flour and water, that developed mold and bad odor. Then when I read your steps here, I decided to try again, using flour of wheat that I milled myself, and OJ. At day six, it began to smell like yeast, with bubbles, and doubled in volume after only 2 hours, then 3 times its volume 6 hours after the second feed. Its amazing how your steps work very successfully the first time. I'm now on day 7, and fed 1/8 cup starter with 1/8 cup tab water and 1/4 cup white flour. This made it rise 4 times its volume in 6 hours! btw, I found a nice idea to warm the starter: I put my glass jar behind the fridge, on top of its heating dissipation pipes, which seem to provide continuous perfect temp for the starter. I have one wish. I noticed that, in this lengthy thread, you have revised some of the instructions that you originally gave in your starting post. This is of course natural, as you gain more experience over the years. My wish is that you write us your revised steps, so that it include any modifications that you have settled with now. This would greatly help a lot of people, specially those with limited time to go through all the posts (it took me a week to read it all). I put the lid lossely on my glass jar. Is that correct? or should I tighten it? 2- must I stir the starter between feeds? (since I started making the starter firm and thick, liquids stopped forming/separating on top). In other words: as long as bubbles are still forming, and no liquids on top, can I leave it without stirring or feeding, and feed it only when I notice the formation of liquids or the stopping of bubble activity? I figure that it would be better to allow it to fully develop, as long as it has enough food, before I disturb its cycle and throw most of it away and force it to start over with a new feed. I could be wrong, but I compare that to when you're having a nap, and in the middle of an ongoing nice dream someone comes around and disturbs your slumber. How does that sound? If you will tell me what you found in the way of revisions, I would be happy to adjust. I read through the original post and I really don't see anything that I do different now. If you are referring to the hydration level of the starter, that is just a matter of personal preference and can be changed to suit your needs. 1. Yes, keep the lid not quite tight so gasses can escape. 2. You can make your starter either firm or liquid, as you prefer. If it is more liquid, you will need to feed it more often. 3. Feed the starter at least twice a day, possibly three times during the two weeks. The starter will tell you when it needs food. When you see that it stops bubbling as much and it falls back, it is time to feed. The appearance of hooch means that it is past time to feed. 4. You can stir or not. It doesn't make any difference. I usually don't stir. It would be great if you add details to that part. Me and other newbies may get the impression that we repeat the same quantities and ratio as the days before. But further down the posts you mentioned that we need only a tablespoon (or is it 2?) from the starter, and discard the rest before feedings. And regarding the hydration level, newbies like me don't have personal preferences yet, so we rely on your detailed instructions. I noticed that lots of questions here evolve around that part of the 2-weeks improving period. What is your recommendation regarding the part of starter that we keep when we do feedings during the 2-weeks period? You're right, I should feed it twice daily, because I noticed after 12h that it went down from 4 times its size to 2 times, plus a mild alcoholic smell, so it did tell me that its hungry and needs a new feed. I did feed it again, and will continue feeding twice a day for the rest of the 2-weeks period. I am trying to use barley as the flour for your starter. I am not alowed other kind of flour. Should I change the ratio of liquid to flour? would you sugest any otrher changes? I have never made a starter with barley flour, but the ratio of liquid isn't critical. You just want it to have a batter-like consistency--not runny and not stiff. How are you planning to make bread if you can only have barley flour? I don't think barley contains gluten so making bread with it will be difficult. I'll be very interested to hear how your starter and bread turn out. Barley contains gluten. People who suffer from Celiac are not allowed to eat it. I am using it today to make flat breads and it is OK. The starter is 4 days old today and smells as bad as my wife thinks it should. I see no bubbles though. I used apple juice for the liquid for the first 3 days. I will be more than glad to update you as I go along. Any whole grain will work for making the starter. Since you didn't use any juice, I would recommend that you add 1/4 tsp. vinegar into the mix. This will acidify it enough so that molds will not take hold and it will also help to lower the pH so the yeasts can begin to grow more quickly. Most often starters take a week to 10 days to become fully active. I wouldn't give up the ship until it is two weeks. I am sure it will start just fine. SourDolady, I came here for help two months ago. With your help I made my first SD loaf and have never looked back. Now I bake mostly sourdough. I have been experimenting on making different types of sandwich breads with my whole wheat starter. So far I am lucky and all turned out very well. Now, I am interested in making a rice flour starter. Have you or anyone else done that before? 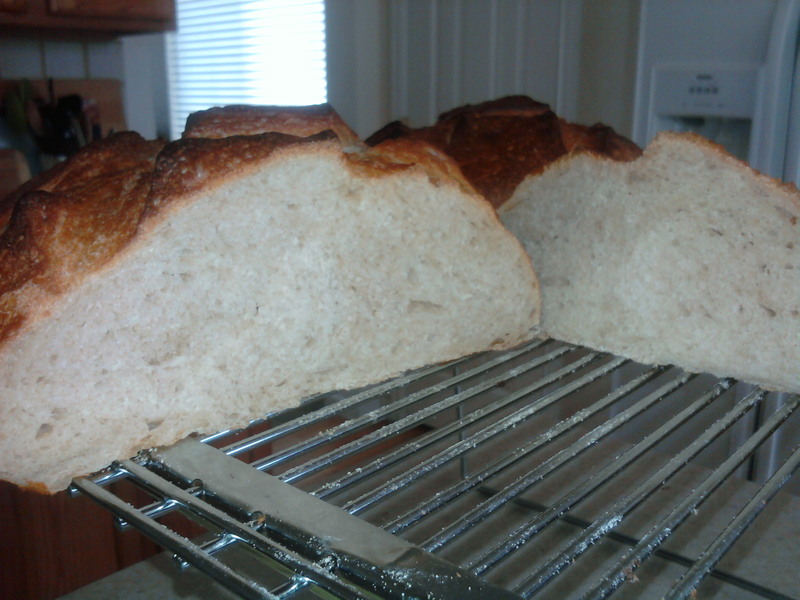 I would like to try using a rice flour starter to make gluten free breads. Do you think it's doable? Yes, you can make a starter out of rice flour. I have never done it, but I have read postings by people who have made them. I also have no experience with gluten free baking--sorry. You might try posting a thread asking for help with gluten free sourdough baking. Someone who has some info may come along and help you. I will post a thread to see if someone else will jump in. Thanks again. I absentmindedly picked up a stainless steel teaspoon to add some rye flour and water to my starter I had sitting out on the counter. Do I have to throw it out and start all over? 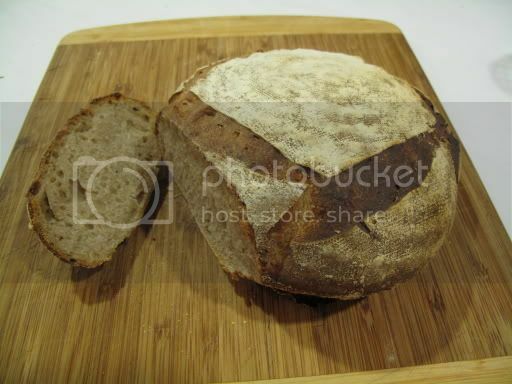 I had been using it for about a month and was getting really nice sourdough bread with it. What will happen to it from using the SS spoon? I'm not gonna chuck it until someone tells me I absolutely have to. Will Sourdough Lady or someone please advise me? It will be fine. Stainless steel is a non-reactive metal and is perfectly safe. Metals that would NOT be safe are aluminum and copper, for instance. I always use SS spoons to stir and SS bowls to mix. Thanks for the response SDL, I had a hard time finding my way back to your blog. But now I have another problem. While my starter was acting so nicely for the last month, all of a sudden it's not doubling itself when I feed it. The weather has gotten cooler, but i've tried sitting it in warm water, putting in the oven with a pan of boiling wter in with it to create some warmth ( no light in oven) I've even taken it outside and sit it in my car on warmer days and still not much activity. I even added about 1/2 teaspoon vinegar to it, afraid it might start growing mold since it wasn't "working" like it had been. I'm at my wit's end, any suggestions? Well, after posting the first part of this post, I was reading some more of your blog that I had missed while I was making bread with my starter and discovered , maybe , the answer to my dilemma. I read that if you don't throw away some of the starter each time you feed it that when you have so much the yeast can't keep up with the "meals" and that slows it down. Soooooooo, I took out some of my starter and put it in another jar with the 2T of water and rye flour and set it in the "nuker" with some boiling water. I will check it in a few hours and, hopefully, I have solved my problem. If not, and this is not the answer, I will still need some help from you. You are such a patient person to answer all our questions when I know it's repetitious to you. combining two different startes into one? pietro, I recently combined two starters, one started with yogurt and one using SourdoughLady's method. They had both performed well but it seemed silly to keep two "pets" so I stirred together 1/8c of each and mixed with 1/2c water and 1/2c bread flour. For all I know they might have had completely different properties, but as far as I can tell nothing "went wrong" and my starter is doing just fine. As yours were made the same way they should be even more compatible. Try a small amount first if you are concerned - of course then you will have three! A. When you combine two different starters, I believe that the stronger of the two will take over and the weaker one will die off. It won't harm anything to do it, though. Can a starter be overfed? Thank you AnnieT and SourdoLady! My starter is vigorous. If I want to multiply it's amount faster to obtain more starter for a large recipe, I've read I can up the water/flour to starter ratio. I suppose the only consideration is that the more feed I give it, the longer I need to wait, right? If I add 10 and 10 parts of flour and water for every part of starter... I suppose the starter won't mind but that I'll need to wait longer for the yeast to eat the extra feed... or are there other problems to consider? Re: Can a starter be overfed? Giving a starter too huge a feeding can overwhelm it and make it take a long time to get back to peak activity. It is much better to give it successive feedings, increasing the amount each time until you have the amount needed. A good rule of thumb is one part starter to two parts flour and then however much water you want to achieve the level of hydration that you prefer. When building this way to increase the quantity, you wouldn't discard any between feedings but you would need to refeed as soon as you see the starter receed (or soon thereafter) to keep the level of activity at its highest. Althetrainer's Russian Sandwich bread looked so irresistable that I had to try it right away. The question someone had asked was how much starter you used instead of the yeast. I kept looking for the answer but didnt find one, so I tried to fudge it. I figured a little extra starter wont hurt. I think I used about 30g white and 30g w/w starter. The dough didnt seem to rise much, so I gave it some folds a couple of times but there was very little rise. I started at 2:30 pm so I should have been able to bake it by 8:30 or so, but by 10 when it still had not doubled, I left it out overnite. By 7 am it had come a little over the loaf pan and I would say it had doubled. So I baked it with steam for 8 minutes at 450F and then without steam at 400F for 30m. At which point it sounded hollow and quite dark, so I took it out and it is now resting. It looks good but feels heavy and I didnt get any ovenspring. I will have to wait and see how dense or airy it is. Q1. Is there a formula for 1t yeast = ? starter. Q2. Does steam create crust or ovenspring or aids in both? If you wanted a soft sandwich loaf with no crust, would you omit steam? Interesting topic, I did try my starter couple of time sometime worked some time didn't work out. I almost give up do starter until I found this web by accident. I'm so greatful to join your community. Next time I'll share my experience. I have to run. No, you don't need to start over. Try thickening up the consistency by adding more flour when you feed it. Usually that will increase the rise. I don't show a lot of bubbles, but there's been a visible layer of hooch for the past couple days. Is that a good sign? At day 11, it smells a bit like alcohol, has some bubbles, but starting to separate more and more every day. It's kind of warm in the laundry/boiler room, where I put it. It wasn't there all the time and it's about 67 in the kitchen, where it was before. I've made preferment before, and I remember it separated, but worked well. I don't know if it's supposed to smell the same or what. Re: Should I start over? It sounds like you are not feeding the starter enough. At 11 days, it should be active and hungry. You should now be feeding it 2 or 3 times a day if you are keeping it at room temperature. Try thickening it up by giving it some extra flour and then feed it every 8 hours. Be sure to also discard most of the old starter before feeding. After just few feedings, there's so much improvement! I was feeding it more flour, but I guess it wasn't often enough. Now it looks so much better, and I think in a day or two will be ready. I'm into day 2 of making a starter for the first time ever and I am so excited to see a lot of frothy bubbles forming! I used Bob's Red Mill unbleached White Flour and unsweetened pineapple juice and placed it on top of my refrigerator near the back where it's relatively warmer than any other place in my house. This morning I opened and whisked it for a few seconds and smelled it and it does smell like yeast! I will be feeding it another batch of flour and juice in a few hours and I can't wait to see the results the following day! It's such an exciting process if you see results like these. Hope I will be able to sustain this starter. I followed your directions and thought I had created a successful sourdough starter about a month ago. I made pancakes with it 2xs and when adding the baking soda, it didn't bubble. Now the starter will make successful sourdough bread (that doesn't taste sour) rises regularly and behaves fine, other than no reaction to the BS. So through a thread I started it seems to me my starter isn't acidic, right? I had one person suggest adding vinegar, 1 tsp, to the starter to get it more acidic. I did that this morning, and then fed/discard 2 xs today, then I tested a tiny amount with BS tonight and still now bubbles. I'm not sure what the reason could be. Try lowering the hydration of the starter so that it is almost like a dough. This usually favors the acids. It could be that the starter is simply just still young and needs some time to develop. Okay, I will try to make it a more firm starter and just wait it out. I did try the cider vinegar addition, but it hasn't helped yet. So, now I have a couple starters going. thanks for the reply. Does this mean like the juice from a fresh pineapple? :) I hope so, cause I would love to make some sourdough starter. I just used juice from a can of pineapple tidbits and it worked just fine. Now, my starter isn't acidic, haven't figured out why yet, but I can't imagine it is because of the canned juice. My starter is over a month old now. I can imagine it could very well be the juice, even after a month. Were the bits packed in only water? Or packed in light syrup? Here comes my "why" speculation (with no scientific facts to back it up) combined with maybe applied reading and mention of this happening with converted Amish friendship starter which also starts up with sugar. Ready? I suspect the sugar in the pineapple syrup has triggered some switches on the genetic code of the beasties somehow telling them they should either feast and produce gas before the normal acid level is reached or they are being told not to produce too much acid. How many generations of beasties it takes for the switches to switch back, I don't know. I can't begin to guess. If we starve them long enough, to the point of forcing them into a dormant stage (where there is more acid) and then revive them, will the starter then be more sour? Will they have switched back to sour producers? Maybe. On the other hand, maybe just adding some acid to the starter will encourage the beasties that like a more acid environment to increase in number and the ones that like a less acid environment to fade away. Either one of these experiments would take at least few days. The starter may be more acidic than you know. Enjoy your non-sour wild yeast. You could add sour your dough by adding buttermilk, sour milk, yogurt or lactose to the dough or see if you can sour it by dropping the rising dough's temperature down to 50°F for a few hours to trigger acid production. Good advice, I had MrFrost tell me to try to add some acid in the form of lemon juice/vinegar to make the acid increase, but that didn't work. Really the only problem with no acid is when I make pancakes with the throw away starter, and add the baking soda, it doesn't bubble. My pancakes taste good, but they are pretty flat, good for pigs in blanets. My kids don't really like the sour taste, so that is not such a problem, but I would like fluffy pancakes. Because the fluffy or rise is caused by a reaction between acid and base, try adding some baking powder instead. Soda needs an acid mixed with it to rise. The other alternative is to stiffen the egg whites before mixing into the batter, results in very fluffy pancakes! Enough said, I don't want to hyjack the thread. I plan on starting a sourdough starter today, and see where it goes from there. It seems everyone is back into sourdoughs... at least from what I've seen. Sourdough pizza crust, bread, rolls, ect. there's so many recipes out there! I think this one is the easiest I've seen yet. I'm not good at figuring baker's percentages, either. If you do a search on site you will come up with a lot of discussions about it that may help you. I grew up in CA in the S. Bay area, and am used to Great Sourdough breads. Due to a job opportunity I moved to GA where good sourdough is just not obtainable. I read your "how to" a few days ago and was intrigued by this method, having failed with a prior water/flour starter some time ago. It gave a nice rise, but none of that sour bite that is so desirable. I just mixed day 1 up and have it out on the counter. One minor question if you don't mind. The instructions say to cover the starter. How tight should the lid be, just placed on loose to allow airflow, or screwed down firm? The lid should be loose, in order to let the gasses escape. The purpose of the lid is to keep contaminates out and prevent the surface from drying out. Good luck with your starter!! Thanks. I was pretty sure the lid was supposed to be loose, but I have seen videos of folks keeping starters in those jars with latches, so I figured I'd double check. I just fed my starter its Day 3 dose and there are some bubbles forming, and a distinct apple-cider vinegar smell - I sure didn't expect that :o) I do not see any other reference to a vinegar smell. Is this normal or something I should be concerned with? I did see vinegar was a possible additive later in the process, but I have certainly not added any at this point. I also, just noticed that you posted these instructions almost 5 years ago! I am humbled that you are still here tending the post, doing everything you can to ensure us newbies get the advice and guidence we need. My sincere thank you. The smell is fine. It is caused by the fermentation process, which is good. You are on the right track! I love helping people learn sourdough. It has always fascinated me and I want to share what I can with anyone who wants to learn. Well, it's day 8, and still no bubble action, and the vinegary smell has all but dissipated. My speculation was that was from the pineapple juice fermenting, but that's just a guess. Since there are no signs of yeast action yet, I will be giving it the apple cider vinegar dose recommend with tonight's feeding. Day 10 (today): Feeding + a second dose of the apple Cider vinegar. Don't give up on it! Don't add any more vinegar. Are you keeping it in a warm place? If it is too cool it will take a lot longer to activate. If you have any rye flour, add a spoonful of it with each feeding for a few days. What kind of water and what kind of flour have you been feeding it? I've been keeping it in the kitchen. The temps there this month have been in the mid to high 70's occasionally bumping into the low 80's if I'm not home and the AC isn't on. Days 1-4 - King Arthur Traditional Whole Wheat Flour. Days 5-6 - King Arthur Unbleached Bread Flour. Day 7 - half and half of the Whole Wheat and Bread flour above. Days 9-10 - half and half of KA Unbleached Bread flour and "Pillsbury Bread Flour"
I thought there might be some yeast critters hiding in the Pillsbury flour, so I gave that a shot *shrug*. The water has always been distilled bottled water from a 1 gal jug. I have been using this same water bottle for normal yeast bread baking so I know it isn't a yeast killer. Distilled water is not a yeast killer, however it does not contain any of the minerals that sourdough needs to be healthy. The distillation process removes all that. Spring water is what you want to buy if you are using bottled water. If you have well water, that is okay, and some people's tap water is good if it does not contain chloramine. Chlorine is okay as long as you let the water sit a few hours to let it dissipate. Chloramine does not dissipate upon sitting. I switched over to spring water per your instructions. 1/4 C. King Arthur flour (about Tbsp of wheat, and the rest the Unbleached Bread Flour I had been using). Last night (Day 15) I finally got a bit of foam on top, and tonight the starter actually rose a little! I'm assuming the yeast is finally waking up. So, what's next? How do I now expand this to a usable portion? Sounds good! I would thicken it up a little now that the yeast is awake. Add a bit more flour than water--your mix of WW and unbleached is good. Feed it twice a day now. You should notice a good volume increase. When it doubles in volume in 4 to 6 hours, then you should be able to try it in a dough. Be patient as it may take several hours for the dough to rise with a young starter. To expand the qualtity of starter, just give it larger feedings. I like to do this in two or three stages and not one huge feeding all at once. When you are expanding the starter, you don't need to discard any before feeding as long as the feedings are done before the starter loses its activity. If the starter has been in storage in the fridge then you MUST always discard before the first feeding when it comes out of the fridge. My rule of thumb is to bake when the starter peaks in 6-8 hours three times in a row. It's something I've stuck with for my other two jars of starter and it seems to work out quite well. So, something that I am a bit confused by...with the starter recipe that I have made before at some point I add enough flour to make it more dough-like. When do I get to that stage with this? At present (day 7 or so) it has the consistancy of crepe batter. Well I have been feeding and babying a starter for a few weeks now. I have made lots of delicious flapjacks and english muffins from it but not yet attempted a "loaf of sourdough" until today. I am from the SF Bay area (recently moved to Denver) so my sourdough bar is very high. I made the dough and let it proof at room temperature for a day then retired shaped rounds to the refrigerator overnight. In the morning I sat them on the counter until double, scored the top and put them in a 450 oven (lots of steam) for 20 minutes, reducing the heat to 360 to finish. The crust is lovely, the crumb a bit disappointing as I was wanting big holes, but it was 50% whole wheat flour so I dunno... does that make it harder to get holes? The crumb is moist and has a lovely texture. Should actually make fantastic sandwich bread. I was nervous about getting good oven spring and loft so I think I fed them a bit too much honey, the final flavor does have a mild sour tang, but also kind of sweet =/ It was a great big case of if a little is good a little more is better, alas, but the taste is delicious overall. Sorry I missed your post. Did you start the starter yet? If not, what are you waiting for? You will love it! Just mix it up and ask questions as they come up. I will help you get it going. Patience is the key! A starter generally takes a week and a half or more to get going. Hello and thank you for your instructions. I am trying out 3 different starters right now and yours is one of them. My other starters really took off but I am wondering if I am having trouble with yours because of the high temps here. Mid to upper 80 F. I am using organic whole wheat flour and mixed fruit juice. The fruit juice has pineapple, apple, grape and carrot juice. It has tiny bubbles but no growth and not very bubbly. Any thoughts? Do you think this will take longer because of the warm climate? I have no cooler place to put it. Also, I seem to keep getting liquid on top very quickly, within 2 hours of a feeding. I guess this is hooch but it doesn't smell alcoholic. Sounds good--8 days is about normal. Now that it is alive, you should feed it more. Starters are very hungry beasts, especially in your warm climate. If you see hooch forming on top (liquid), then that means it is very hungry. You may need to feed it 3 times a day now, or if you thicken it up you could get away with twice. It is still developing its strength and flavor, so you don't really want to put it in the fridge just yet. I am at day 5 of my starter, when i feed it, do i continue to take out a 1/4 and discard the rest? Or do I just add the four and water and not discard anything? I feel like discarding is such a waste, but this fine? Why exactly do we discard? Now I should wait a couple of weeks doing this? Do you have a good recipe suggestion for when my starter is ready? this is my first time making sourdough! and correct me if im wrong, but starters will last forever? i can now save some of this starter and continue to feed and it and use it for others breads? I'm a longtime lurker at TFL, and registered just to add a tidbit to this thread. I finally decided to tackle a starter, and used this formula. I got a good start and things were going well to day 4. Then I started combining the 1/4 cup flour, water and starter, as directed. Things started going downhill. I pampered the starter, keeping it under a lamp, feeding more often. Nothing seemed to help. I occasionally noticed tiny pinpricks of bubbles on the surface of my soupy starter, and that's the only thing that kept me from pitching it and starting over. I kept feeding, going on to day 13, and despite my pampering, my starter seemed doomed. Then I read another starter thread here on TFL, and a lightbulb went on. By adding 1/4 cup of flour and water as feedings after day 4. the hydration of my starter was becoming astronomical! I immediately changed to a 1:1:1 formula BY WEIGHT, and land-o-goshen, if things didn't immediately pick up! Woohoo! The problem with a thin starter is that you get no bubbly feedback to tell you the yeast is growing. In fact, it appears I had good growth, I just didn't know it. The bubbles just rise and burst. With a thicker starter, the bubbles have some resistance, are easily spotted, and they have some glutenous structure to rise against. It's taken only two feedings at 1:1:1 by weight to get great progress. Maybe this will help someone else in the future. This post will be a long way from the start of this thread, but I've read all the posts a couple times, so others must do that as well! Thanks heaps for your post! you have given me something to take my mind off some difficult periods. I have a huge passion for baking bread but have never taken the time to try sourdough. I have peter reinharts bba book and have been making some great multigrain/ciabatta/pizza and baguettes using his amazing recipes. day1 - day2 - day3: I was going to use his recipe for a sourdough starter, but googled sough dough starter and found that people were having more success with the method that you were using. I went and bought some stone-ground organic starter, and wholegrain organic. All local milled flours. I started with 2T flour to 2T of orange juice. It is winter here and has been getting colder- frosts at night and highs of 12C. I put on window sill where it gets a little sun during the day - its the warmest part of the house. 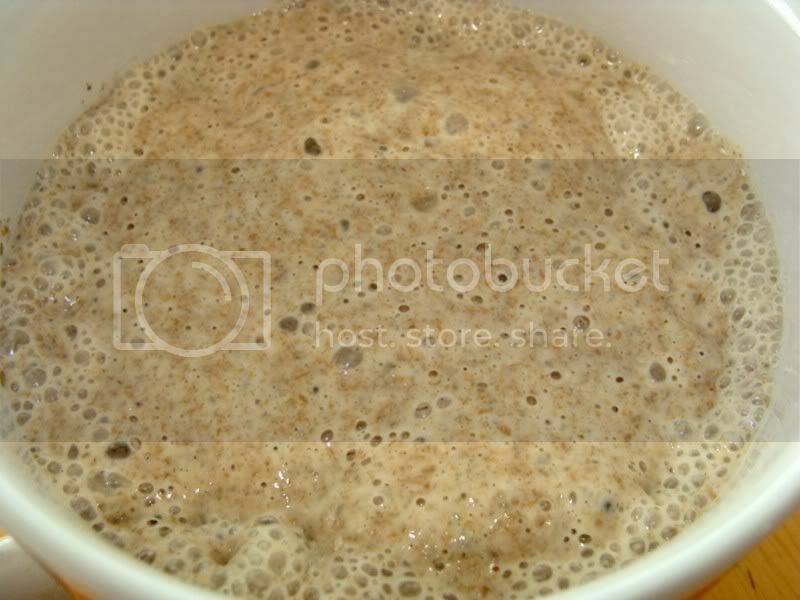 My wholegrain starter looked too watery and had a layer of brown water after each day, there was no rise or bubbles. And my rye wasn't as watery, but had a few bubbles - no rise in the rye either. day4, day5: I switched to discarding but 1/4c and adding 1/4c water and flour. Now I thought that I have killed my wholegrain starter since it is doing absolutely nothing! so I read a comment saying the extra liquid on top means it is runny or hasn't been feed in a while. So I added 1/4 + 1/8 of water to 1/2 of wholegrain flour to make it less watery since I thought it was dead. My rye since it had not many bubbles I left for another 12hrs- (36hrs between feed) to see if there was any more activity since I thought the temperature might be slowing it down. I have also switched to keeping my sourdough in the hot water cupboard instead of on the window sill. I thought the sunlight might kill it. day6: Wow, from making my wholegrain with more feed, it almost overly doubled in size and is now dropping down. My rye starter is still the same with just a few odd bubbles coming through. Was feeding my started double a bad thing? Was adding slightly more flour bad (1/4 + 1/8c water with 1/2c wholegrain flour)? Shall I add more water next feed to make more watery again? Shall I adjust my feeding sizes? 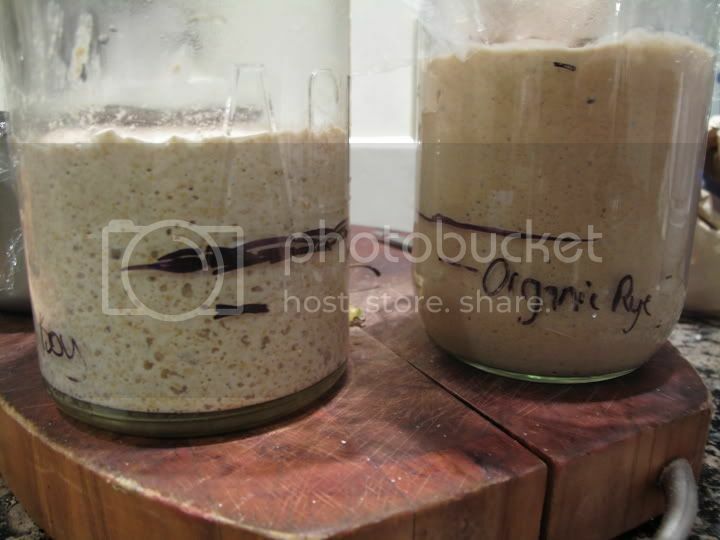 Where is the best place to put my sourdough starter during the day in winter? Thanks so much for your contribution to this sight everyone, this is a awesome community! My starter is 2weeks old... awsered all my questions almost. am now feeding my starters on a 1:1:1g ratio... here is my 3rd atempt. Just a bit heavy on the bottom. I've got a blog now so and am soo keen... loaves are starting to fly out of oven. Just wish my terricotta baking stone would hurry up! Have fun working with your new starter! Hi: I was successful in getting starter going (I'm on my 5th day), but according to Peter's Bread book Crust & Crumb, I'll be needing a couple of CUPS of this starter to add to my sourdough bread, and I don't/can't figure out how to scale up the amouts given so I end up with a quart of starter. HELP!!! I gotta feed this puppy asap! Waiting to Rise in So. Oregon! Last year (fall 2010) I made a starter using this pineapple juice 'recipe' and whole wheat which I transitioned to (quality) bread and later AP flour. The yeast were so active that feeding 3~4 oz starter with 2 oz water and 1 1/2 ~ 1 3/4 oz flour in a quart deli container would blow the lid off the container within an hour (at room temp) and the starter would crawl most the way out of the container in an impressively short amount of time. This level of activity made it sort of hard to give away, the bubbling up and blowing the lid off the container made transport a bit difficult. Problem is it didn't have a whole lot of 'funk' to it. This year (fall 2011) I made a starter with stone ground rye and spring water. Went from rye to whole wheat to white whole wheat to unbleached AP. The funk is fantastic but it's not very active. Probably too much bacteria. So I stopped by to see how much vinegar to add to the water to get the pH / acid up to needed levels (1/4 tsp per 2 oz water). The first feeding seems to have increased the bubbly a bit at the cost of a little funk, I guess thats how it goes. This fall (2012) I'll just start out with pineapple and rye. to start mine. It is day 6 and all goes well. It seems to me that you could increase the flour at this point to get a stronger culture - faster? 1 to 1 water / flour is a starvation diet if it wasn't being fed every day - right? Just a thought. Thanks for the easy way to start sourdough. I want to see if it is better than what I have been using. I used Clayton's Complete Book of Breads in 1973 to start my last one using nothing but flour and milk. It took two or 3 tries instead of 1. I've done everything I can to kill it off over the years but those old beasts are remarkably tough and nothing has worked to put them down for the count. But I will keep trying no doubt. Thanks once again. Yes, 1:1 would be starvation in an established starter. At this stage of the game it isn't. Once your starter becomes very active and bubbly you will want to increase the feedings. If you feed too much at once in the early stages you will be drowning your starter. There aren't enough yeast cells yet to consume a lot of food. Your starter will tell you when it is hungry. It will collapse and eventually form a layer of hooch. This means it has used all its food. I prefer to feed a young starter that has become active two or three times a day instead of giving it one very large feeding. After it is about three weeks old you can give it larger feedings if you want. Thanks for the recipe. A lot of help. I substituted lemon juice for pineapple juice because it's what I had around the house. I mixed together 1/4 cup rye, 1/4 cup all-purpose, and 1/2 cup lemon juice. Do you think this will work? I have no idea. No biggie if it doesn't; I can always throw it out and start again! I have never used lemon juice myself, but I have heard it can be done. I do believe that lemon juice has a much higher acidity level, though, and should be diluted before using. You might want to discard half of your mixture and then refeed with more flour/water. Too much acidity can be harmful. Orange juice or apple juice can also be used if you don't have pineapple juice. Good luck! I took a whiff of the starter today and it smelled like straight lemon. The thought then occurred to me that the lemon juice might need to be diluted. I'll toss half and add some flour and water. We'll see what happens could be a success or an epic fail! Either way, it'll be fun. I haven't been making sourdough bread too long, but my starter is a wild yeast one. 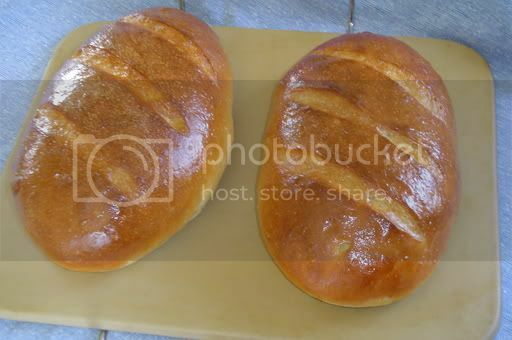 My question is: In reading some recipes for sourdough bread on other sites, their sourdough starters included sugar and vinigar, why would this be ? The bread looks great, more like a sandwich bread. Thanks for your feedback on this. The only ingredients that are necessary (and traditional) to make a starter are flour and water. That being said, there are also other ingredients that can and have been used but are unnecessary. Sugar is like junk food to a starter and most people do not use it. Vinegar will increase the acidity of your starter and this can help in the begining stages of creating a new starter, but once your starter is active it will create plenty of its own acid and is not needed. Some people put vinegar in the bread dough to give their bread a more sour flavor and others use a product called 'sour salt' or citric acid. These souring additives are what is put in a lot of grocery store sourdoughs to give it that really sour flavor that many people really don't like. Then they think that homemade sourdough breads will taste like that too and they will tell you that they don't like any sourdough breads. The truth is, many homemade sourdough breads have no sour taste at all--they just have an awesome flavor that commercial yeast breads don't have. YOU can control how sour or mild your bread tastes by the way you feed and ferment your sourdough. No success after 2 trys but I now really like pineapple juice! In fairness, my second try started looking good but I forgot to feed it on a timely basis and rip. I purchased a glass measuring beaker with a plastic lid specifically for getting your starter right. I received my copy of Peter Rienhart's Whole Grain Bread a week ago and noted that some of his testers had trouble with their starters, which was overcome by stirring. I will try. Every day is a new adventure. Thanks for sharing your knowledge SourdougLady! Thanks, this is a great thread! As you are feeding your sourdough starter a day or two before you add to a recipe, I want to know, "do you stir the starter down first before measuring," or just pour out the measured amount you need as it's rising ? I don't remember ever reading about this anywhere, thanks for your help. Yes, you would stir it down before measuring. If it is really active and bubbly (as it should be) you will still have lots of air bubbles in it. Ideally, weighing your starter as well as all your ingredients would be the way to go. Not all recipes are written to be used with a scale, though. When you measure ingredients you must be prepared to make adjustments to the amount of flour or water to achieve the proper consistency of dough. Sometimes this can be a challenge for a newer baker who is not used to proper dough consistency. Thank you for your response SourdoLady, much appreciated. I have not made many sourdough breads, but love experimenting. 3rd time lucky -- many thanks! The seed hav at least tripled, so I proceeded to start both an all purpose and light rye starter. That's fantastic! Your starter looks very healthy. Have fun baking, now. Concerning discarding all but 1/4 of the starter when beginning to develop it, can that we used to create anothere jar of starter? I imagine at that point the discarded amount is still too immature ot be used to leaven a bread but can it be used for flavouring of loaf that already calls for yeast? There wouldn't be much point in using it to create another jar of starter, unless you have a friend who wants one. Yes, of course you can add it to a recipe that has other leavening. You are right about it being too immature to leaven bread in the earlier stages. Feel free to add it to another dough, quick bread, biscuits, or pancakes. Keep in mind that you may be altering the hydration of your recipe a bit and may need to compensate for that. “Wild Yeast Sourdough Starter Day 1 - Day 7 followed directions, everying went OK but it did not expand or smell, on day 15 tried using starter on live drill as prescribed in the recipe for making bread. It did not rise bout baked it anyway and have a goog hard ball. OK, so I have been nurturing the starter along for 11 days now and it is seems to be doing very well. Initially you said to feed it once a day but then I saw you write this so I am a little confused. "It should be fed two or three times a day once it gets real active. It is ready to bake with when it consistently doubles in volume within a few hours (4 to 6) after being fed." My starter doubles in even less time than that and I have been feeding only once a day. I made a small variation as I was getting lazy about measuring out 1/4 cup and discarding the rest, so the last few days I've just added the 1/4 H2O and flour. Will that screw it up? I'm rambling a bit, sorry. The main question is; how do you increase the volume of the starter. For example if a recipe calls for 1 cup of starter and you don't have that much? And also when a recipe calls for 1 cup of starter does that mean AFTER you feed it and it has doubled? ANd does it matter if it is a firm starter or liquid one? One more thing, I have a recipe for Volkornbrot that calls for instant yeast AND 2 tbsp of starter. Do you think the starter in this case is more for taste? Thanks for y our help. To increase your starter amount, you simply give it larger amounts when you feed it. In the beginning stages you only need to feed it once a day because it is not active yet. Once it gets active it will consume more food. Instead of feeding 2/3 times a day you could just give it one larger feed per day. After about another week of keeping it at room temperature you can move it to the fridge. When kept in the fridge you will only need to feed it once a week (or when you take it out to bake with it). Yes, it is very important to discard before feeding (or use the discard amount in a recipe). If you don't do this, over time your starter will become more and more acidic and begin to degrade. It will start to not rise your bread well because the acids will eat the gluten. Put the discard into some pancake batter if you don't want to waste it. On your recipe that calls for 2 Tbsp. starter, does it have you do a preferment with the starter? Usually when such a small amount of starter is called for that is how it is used. I would follow the recipe as it is written. Good luck and have fun! Paul, What do you mean by hooch? Here in NZ during Prohibition it meant illegal booze. My 1st sour dough starter I'm at present developing is a homogenous mixture. Maggie, hooch in a starter is the alcoholic by-product that is produced after the mixture has fermented to a ripe stage. If a starter is kept well fed you shouldn't see any hooch. Sometimes with a very liquid starter you will get separation just because the excess water floats to the top. Hooch will have a definite alcoholic smell. I guess the old-timers did drink it, but I can't imagine that it tasted very good! Let me first thank you for the wonderful information & tips on soudough. After being a passive observer of this thread for a long time, I finally decided to make my own starter in Oct 12 by using the pineapple juice method. It has worked far better than my expectations. It kept to the schedule. After first week, I was feeding it 1:1:1, twice a day & leaving it on countertop. But as I live in hot climate (85 - 95F avg room temp), the breads made were coming out quite sour even after retarding the dough in refrigerator. But once I started keeping my starter in fridge & taking out only when I needed to bake, I am getting some superb breads. 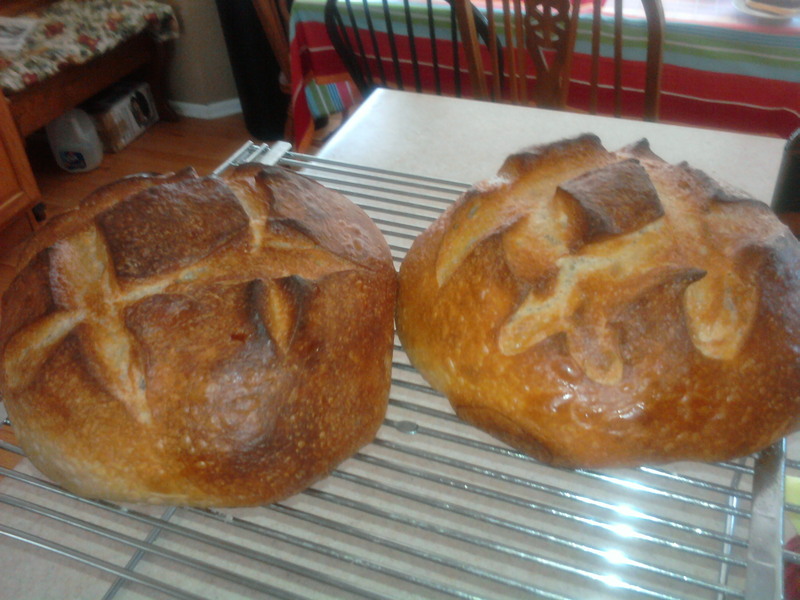 Lately, I also started baking Jim Lahey's no knead bread & its variations, which is well received at home. So the next step was combining the two. Now instead of instant yeast I use 50 gms of starter, straight from fridge, and reduce the flour & water in recipe by 25 gms, each. The flavour of the breads is great. If I have time to monitor (high temps can really skew all timelines), then I slowly build the starter to final dough over 2 or 3 builds, but the climate here is such that even the fridge cold starter gives a wonderful rise in few hours. I even manage to get a wonderful sourdough bread in my bread machine for my kids, who prefer soft, sandwich loaf. Curently, I am trying different recipes from Peter Reinhart, using my starter. As there are not many resources available for hot climate sourdough baking, I have to go by my own instinct and look of the dough. I am reading conflicting views on retarding of sourdough (for bulk fermentation or after shaping) in fridge for hot climates. What is your take, SourdoLady? We do not like a distinct sour taste in our breads, but prefer a mild sour flavour. It sounds to me like you are doing a fine job of figuring out the behavior of your dough in your warm climate. I don't know too much about baking in a warm climate, but I think you already have a good handle on it. As far as retarding in bulk or after shaping, I think it is purely personal preference. I always do bulk because it is just so much easier to fit in the fridge that way without worrying about it getting smashed (I have boys who are not very careful). Are the breads you are baking now mild or sour? Usually the longer it ferments, the more sour it gets. That goes for the starter as well as the dough. The addition of some wholegrain flour will also give your bread more sour, as it tends to ferment quicker. Thanks for your reply. My reason of doing bulk in fridge instead of post shaping is due to space. As of now, the taste is pleasantly sour, but I think we will prefer it a bit more mild. I am thinking of giving Yeast Water a try and see if it works better for us. Having said that, I have really no major complaints about my sourdough. I use it quite interchangeably or in conjunction with Instant Yeast. For wholegrain breads, I just increase my starter to one cup, directly in the final dough, adjusting the flour & water, to keep my fermentation short & this seems to take care of the extra sourness I encountered when I first tried with either less starter or using starter with more builds. I have also learnt to do my long fermentations during night instead of day and use as cold ingredients as possible, so it is long enough to develop a nice flavour but not too long to make it very sour. i've tried this in a canning jar. it doesn't seem to be as active as the ka starters. what am i doing wrong? I first heard of and learned to make sourdough bread in 1974 from a school friend who, after we had spent a few years apart in the Army, wound up in another kind of school with me. I made two large loaves every weekend from then through about 1985 when adult and family demands cut into my free time, and, sadly, bread baking ceased its fearless roar. A few weeks ago, however, with kids grown and gone, wife grown and gone, and living with a fat cat named Bismarck, who I inherited from a baker's widow, I thought that I sensed a camel's nose in the tent flap. I didn’t really mind. It was a cool night, and her breath smelled faintly familiar. The cat gave me a significant look, licked his chops and winked. Then it hit me! The camel was a dumpster diver and had been eating unsold sourdough and salt rising bread. I was reborn! My life had new meaning! I would start baking again! The cat was in the formerly empty nest; I had adjusted to not having a wife; and it never would have worked out with the camel anyway. I tried salt rising first, never having previously succeeded at it, and, with help from my new best friend on YouTube, I actually managed to bake delicious salt rising bread on two occasions. About 36 hours into the process mentioned in my March 9 posting, my first attempt at making a starter since 1985, which was begun ca. 4:00 a.m. on March 9, 2013, was doing the jitterbug and blowing bubbles. I used a combination of equal parts barley, oats and wheat. I did borrow from SourdoLady's pineapple idea, but used clippings from the top and hide of a fresh pineapple, bound in a small net and suspended in the mouth of a Mason quart jar above the other ingredients. We had some cool weather Saturday and Sunday, so I sat the jar on a heating pad on its lowest setting from bedtime until mid-morning to try to maintain a warm temperature. I also couldn't resist giving the net/bag an unscientific but, nevertheles, curious poke, thump or shake, now and then. In any event, the "starter" appears to be, if anything, ahead of schedule, so I plan to do the first discard and feeding sometime on Monday. I have a natural starter, it rises about half of its volume then flattens. it gets little bubblies all over the top but does not expand again. I am wondering if the ACV trick is what I need to do.I used whole wheat flour in the beginning, now I feed it either that or AP flour, usually alternating. For my liquid I use just water. I have tried to make bread with it, but unless I add active dry yeast to my recipe it takes over 24 hours for my loaf to rise. This just does not seem normal to me. Any advice? I am going to seperate some of my starter and try the ACV. I followed this recipe, except I added 1 Tbsp organic rye flour, 1 Tbsp Whole Wheat flour, 1 Tbsp unbleached bread flour and 1 Tbsp unbleached all purpose flour and the pineapple juice the first day. I wanted to cover all the bases and have the greatest chance of capturing wild yeast from the various types flour. I only added the flour listed above, pineapple juice and later water to the starter. After a few days I only fed the starter all purpose flour. The starter was kept in a Gladware container on the kitchen counter, loosely covered. I stirred it twice a day. It was the consistency of a thick pancake batter. The room temperature was about 70-F at night and 78-F in the daytime. After 7 days, I baked a boule that rose in about 4 or 5 hours. This is the best starter that I have had up to now, and the first I started from wild yeast. Thank you. Was reading through the comments and questions on this post and I am humbled by the wonderful, helpful, response from SDL and others. You guys rock! I used this recipe to start my first attempts in May this year and have had 100% success with all my bread and I was an absolute beginner! Follow the instructions and you can't go wrong. I am always pushed for time so my schedule is like this........ My starter lives in the fridge all the time. If I'm baking, I measure a generous 1/4 cup of starter into a glass bowl the day before baking and use that to build a starter dough/sponge/mother starter (as in Peter Reinhart's book). I then feed the remaining starter and leave it out of the fridge till it starts getting active and then pop it back into the fridge. That way I don't have an accumulation of starter that has to be discarded. I'm rather emotionally attached to my starter and always feel like a serial murderer when I discard any of my colony...... Sure it makes hooch which I just stir back in and sometimes I give it a little extra feed using equal quantities whole wheat flour and water, but it has never let me down and I love that earthy, yeasty smell and taste....... Wonderful. Thank you Sourdoughlady! I finally succeeded - Thanks! I finally succeeded in getting a wild yeast starter going with just flour and pineapple juice. My first starter from just flour and pineapple juice. I used a tablespoon each of 4 flours to hedge my bets and it worked. Hodgson Mill Organic Rye Flour, Stone Ground Whole Wheat Flour, Unbleached Bread Flour and Unbleached All-Purpose flour. I used pineapple juice from a can of pineapple packaged in its own unsweetened juice. The first day I added 1 Tablespoon each of the 4 flours above along with enough pineapple juice to make a thick, pancake like batter. I placed the sourdough starter in a Gladware container, loosely covered by the lid, on the kitchen counter. It was about 70-F to 78-F day to night. I stirred the batter, to incorporate air, twice a day. On the 3rd day I added an additional 1 Tablespoon each of the 4 flours above along with enough pineapple juice to maintain a thick, pancake like batter. On the 4th day the first bubbles appeared. I started feeding the starter unbleached bread flour and pineapple juice. On the 5th and 6th day I added additional unbleached bread flour and pineapple juice. 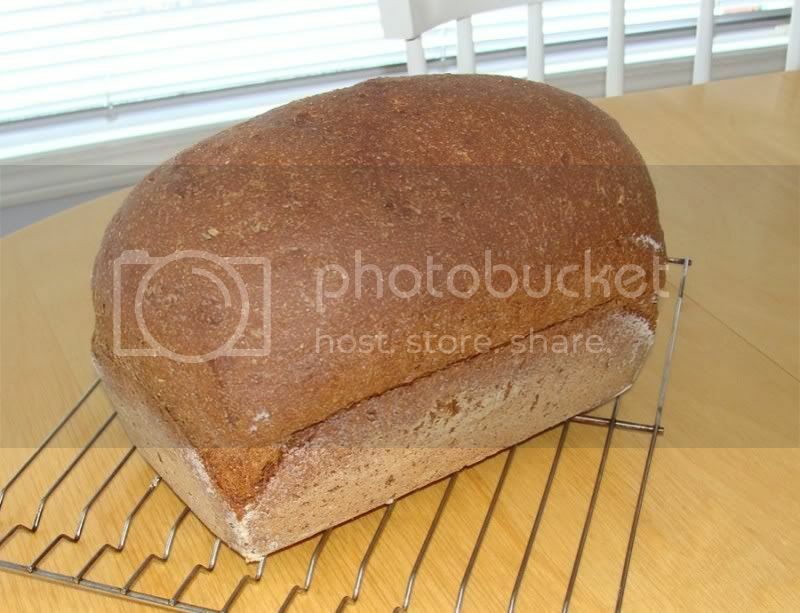 On the 7th day I started feeding unbleached bread flour and water. The starter is really active and foams up a couple of hours after feeding. On the 8th day I made a loaf of sourdough from the starter. It rose quite well and made a nice loaf of bread, but it was not real sour. The starter is now about 3 weeks old and smells nicely yeasty and sour. I am going to attempt Peter Reinhart's San Francisco Sourdough (from Artisan Breads Every Day), using my new wild-yeast sourdough starter. I realize my question seems a bit stupid, but I just started my own starter and I find it strange that I should be discarding most of it everyday before a new feeding? Why should I throw away a part of the starter when I can clearly see it bubbling almost uniformly? I mixed 50 grams of King Arthur bread flour with 50 grams of King Arthur Whole Wheat four and 100 grams of salt water. I let it sit for 24 hours and no bubbles. Day 2, I added the same amounts without dumping anything. Day 3, Started to get a few bubbles, not many. I dumped half of it and replace it with equal amount of the 3 ingredients. Day 4, I woke up and looked at my starter and it was in full bloom. I gave it the float test and it floated. I dumped half of it and fed equal amounts of the 3 ingredients. Day 5, it hit the NORMAL stall. There were no bubbles and it looked like a thick pancake batter. I dumped half of it and replace with the three ingredients. Day 6, still no bubbles. I dumped half of it and replace the same 3 ingredients. Day 7, still no bubbles. I dumped half of it and replace the same 3 ingredients. Day 8, the starter was fully bloomed and it passed the float test... It was ready to use to leaven a loaf of bread. I live 500 feet from the beach in Hermosa Beach. The ambient temp of my house was about 70 degrees. I didn't find to need to add any juice or anything else. I think people get freaked out when their new starter hits the normal stall and they start putting in stuff to speed it up. Just wait the stall out and keep dumping half and feeding it. Within 10 days you will have a good starter going. I made a starter using apple yeast water which I cultivated myself. For the 1st 2 days, the starter was very active and easily tripled in less than 6 hours. However, from day 3 onwards, the starter got sluggish and only rose a little in 12 hours. The first time, I thought my started died so I dumped everything and started all over again, and the same happened. 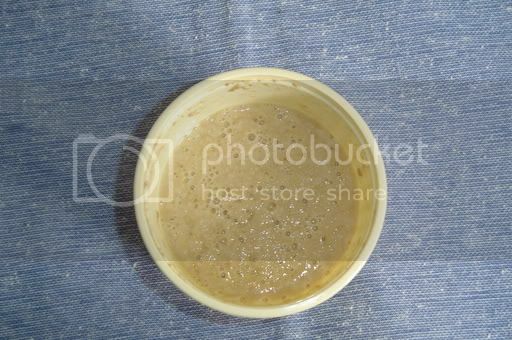 Its day 5 now, the starter has some bubbles but it very sluggish. What should I do? I really hope to be able to revive the starter. with this recipe, to ake the starter. I was wondering, instead of keeping 1/4 of the mixture and discarding the rest of the mixture, can we just make two batches of starters? Hi I was recently given a starter from a friend who had been making successful loaves with the parent starter. The starter had stopped bubbling and appeared to be quite dormant. I mixed it and fed it the bread, filtered water and gave it 1 tsp of cider vinegar. It began bubbling but was quite runny so I increased the amount of flour I was giving it and have continued on for the last 2 days doing this. The starter seems to be quite active (bubbling) but I cannot get it to the point where it floats in water when I test it. Does this just need time or should I start again? My starter was made on Valentine's Day, (02/14/2016); I've followed these directions, and I'm at the point of putting in the 1/4 teaspoon of apple cider into the mixture each day; the mixture looked flat and dead for about 3 days, but today it is "soupy" and very "bubbly" on top. 1. Am I headed in the right direction? 2. When do I stop repeating "Step 4"? 3. Once in the refrigerator, how long can I go between feedings? 4. How do I get this small starter amount to the volume of what I need to make a 1st sour dough loaf? 5. My starter was covered throughout this process, and in a proofing box. Should I have done this uncovered? 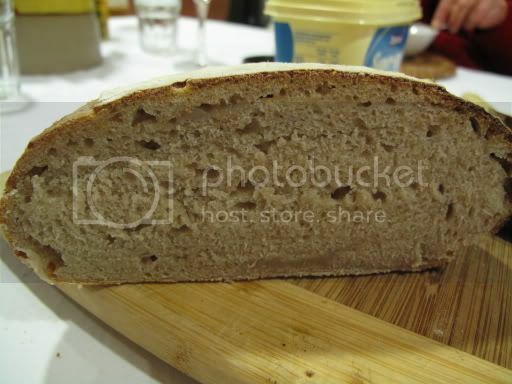 I have been making sourdough bread for sometime and I have noticed that after a day or two it becomes dry and heavy. It does have moisture in it but it seems to migrate to the outside of the loaf(does that make any sense?). I have been trying to work the dough a little wetter so that I can have larger bubbles and bread that stays more moist, something like the sourdough bread at Whole Foods. I used to only use the sourdough starter for my bread, but I have been experimenting with adding commercial yeast to the mix....with very small success. So, the question is, how do I get a light, sourdough loaf with larger bubbles that stays moist for a longer period of time? I am just embarking on my first 'starter' and appreciate your in-depth description of how it will react (or not) during the process. I would be very interested in the recipe you used to produce the very nice loaves pictured above. Is there a recipe for the loaves that are pictured above? I made an interesting observation on keeping a starter in the fridge. After a few weeks I noticed that milk for instance went sour, like I knew from my childhood days, instead of smelling bad. Cheese also stayed fresh longer without putting on mold, especially the black variety. Anyone make the same observation? I am a highschooler in 11th grade working on a senior thesis project. I plan to do something related to fermented sourdough. I see you baked bread from the starter. I have started making the starter, but I am stumped at how to make the bread. How much flour did you use to make the dough and what steps did you take? Here I go - my first day - just started, on the way to yeasty smell...I hope. I've been seeing where some people say they do 100% hydration what does that mean? I am on day four of the ps, just added apw flour to it! I am so excited to be on my way to a sourdough bread.